Manus McGonagle (pictured) is the founder of the Quality Sea Veg company based at Burtonport, Co. Donegal. He was just a child when he began harvesting "Dulse" and "Carragheen" from the rocky shoreline with his father, where it was spread on rocks to dry naturally before being sold onto customers. Years later after equipping himself with an engineering certificate, he started his company, Quality Sea Veg in 1986, his purpose to harvest the best sea vegetables from the pristine Atlantic waters off the Donegal coast to meet the increasing demands for sea vegetables in Ireland and Europe. With his engineering knowledge he devised a complete sea veg production system, allowing the sea vegables to be dried, milled, produced and packaged to meet the legal requirements of hygiene regulations in accordance with HACCP (Hazard Anaylisis of Critical Control Points) and tracabilty of each product produced and dispatched. Quality sea vegetables are harvested and processed in Cloughglass, Burtonport providing a source for the freshest products from the sea. 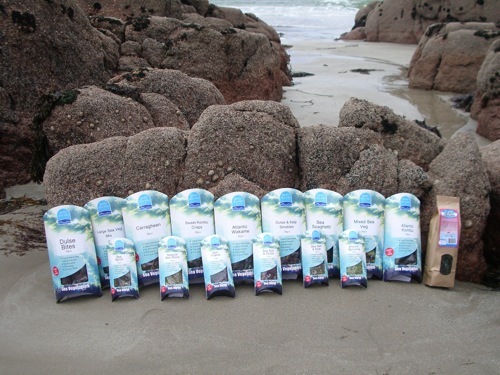 All Quality Sea Veg products are hand harvested, air-dried and hand packed. There are green, red and brown sea veg all of which are naturally high in minerals and vitamins. The combination of colour, taste and health benefits makes them an ideal addition to cooking and experimenting with and are suitable for vegans, Our product range allows for those who have the time to cook or for those who wish to add our products as a condiment or garnish, where they benefit from their nutritional value.